In Checkout please add: Recipient e-mail, and your personalized message. 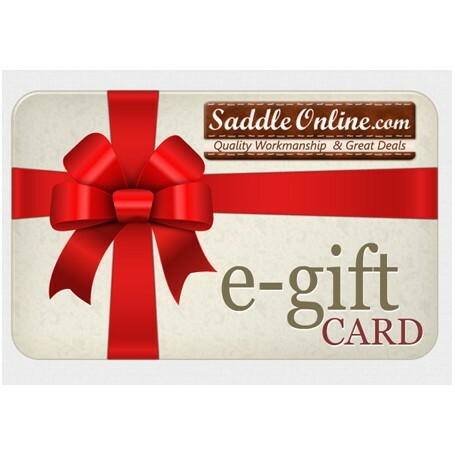 A SaddleOnline.com e-gift card is the perfect gift for the equestrian enthusiast in your life! You can pick out the amount you would like to give, and keep it personalized with your very own message! The best part is that there is no expiration date so they can make their purchase at any time! Electronic gift cards are available from $50-$200. Special gift card code will be sent instantly via e-mail. Call Customer Service at 800-967-2335 to order by phone. Gift cards are not cash redeemable. All returns will be issued as a store credit good only for use on SaddleOnline.com. Gift card codes cannot be combined, per use only.